We’re nearing the end of the Spring 2016 program! CK teens are revising their poems, short stories and other literary pieces; adding design flourishes to their book covers; recording more audio pieces; and preparing for their performances during tomorrow’s Spring Program Showcase at SRBCC. You’re invited to read the Chicago Kaleidoscopes Anthology for the Spring 2016 term; follow this link to read it. Our Spring Showcase is coming up soon! We’re delighted that Chicago Kaleidoscopes will be among several After School Matters programs that will be participating in this Showcase, and as with the Showcases during the Summer and Fall 2015 Showcases, SRBCC is hosting this event. This will be another excellent opportunity for CK teens to demonstrate their talents, meet teens in other ASM programs, and have a fun time at the wonderful Hermosa-based arts organization SRBCC. Chicago Kaleidoscopes is excited to be participating in the upcoming ASM Arts and Tech Fair! CK teens will be performing poetry and fiction. The fair will feature presentations and performances by Chicago teens, interactive workshops, and innovative projects with the following participating organizations: Chicago City of Learning, Traditional Puerto Rican Bomba Program hosted by SRBCC, Level Up Youth Maker Space, Spoken Word Academy of Chicago, Nature Museum TEENS (Peggy Notebaert Nature Museum), Chicago Kaleidoscopes, Digital Youth Network, and Smart Chicago Collaborative. Attendees can also find out about registering for After School Matters’ summer 2016 programs. The ASM Arts and Tech Fair is free and open to the public. Refreshments will be provided. Note: Check out this article about the ASM Arts and Tech Fair that was published on the After School Matters website! Chicago Kaleidoscopes looks forward to participating in the upcoming Chicago Teen Literary Festival. In the upcoming weeks CK teens will be developing literary works and performance pieces that will be performed during CTLT. Each teen needs to register for ChiTeen Lit Fest via this link. 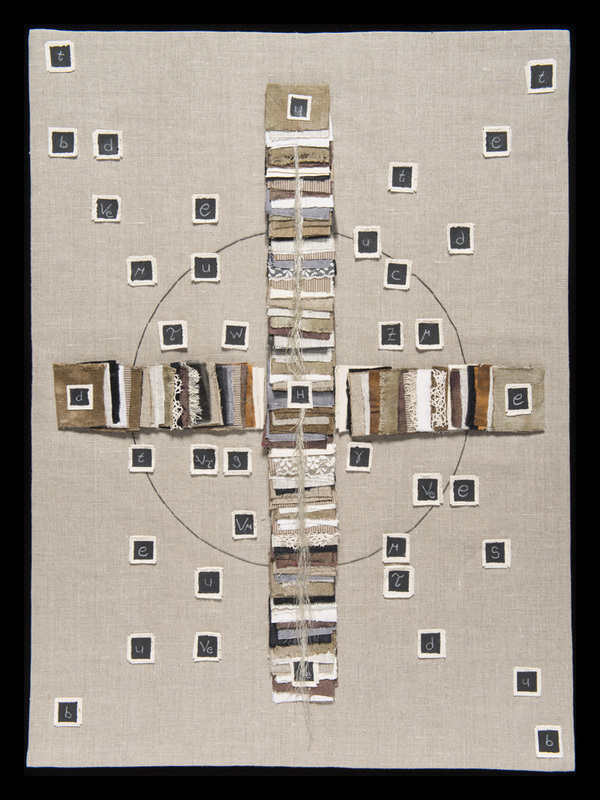 We’re looking forward to our upcoming fall program showcase, hosted by the Segundo Ruiz Belvis Cultural Center. This showcase also features several other youth arts programs. See you there! Yesterday’s showcase at SRBCC was wonderful. CK teens performed with teens in the Bomba ASM program, and we watched teens in the Bomba program perform. It was a fun way to end the program, and parents and siblings of CK teens came to enjoy the event. In addition, we had several interactive stations at SRBCC where everyone could be creative — such as contribute to the Multimedia Archway and have fun with the Time Machine Typewriter. Click here to read the Chicago Kaleidoscopes Anthology. 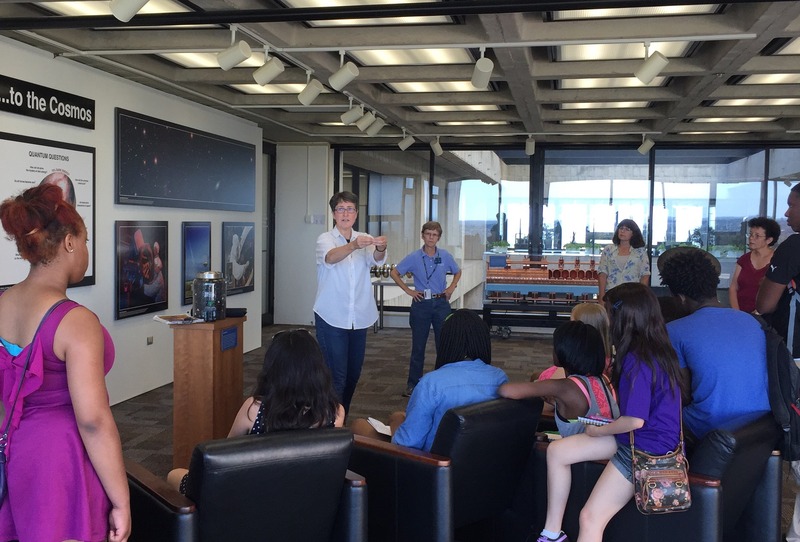 We had great time on yesterday’s field trip to Fermilab. Chicago Kaleidoscopes took a bus trip from Mozart Park to Fermilab in Batavia, and we were met by Fermilab staff in front of Wilson Hall. Docents gave us a tour — which included a focus on particle physics, how science has influenced the arts and vice versa (e.g. how James Joyce’s neologism “quark” was chosen by a physicist to name a subatomic particle, how several of our CK sessions included preparations for our field trip (e.g. the “Poetry of Science” conversation with Neil DeGrasse Tyson and Richard Dawkins), and pop culture connections to what happens at Fermilab (e.g. The Big Bang Theory TV show). The view from the 15th floor of Wilson Hall is extraordinary, with a view of the Main Ring and the Tevatron accelerator, a vista of the surrounding prairie, and the Chicago skyline on the horizon. Then we took the elevator to the second floor, and we finished our trip to Fermilab by experiencing the On that Note exhibition in the art gallery. We had a musical jam session in the gallery, and then we headed back to the bus for our trip back to Chicago. Here are some audio tracks of CK teens playing music in the Fermilab Art Gallery and talking about ideas about superpowers that relate to altering laws of physics. Here are audio recordings of short stories that CK teens created in collaborative groups; each of these pieces of short fiction uses Fermilab in an inventive way. Special thanks to Georgia Schwender, Anne Mary Teichert, Dee Huie, and Kurt Riesselman at Fermilab for helping us with our field trip. 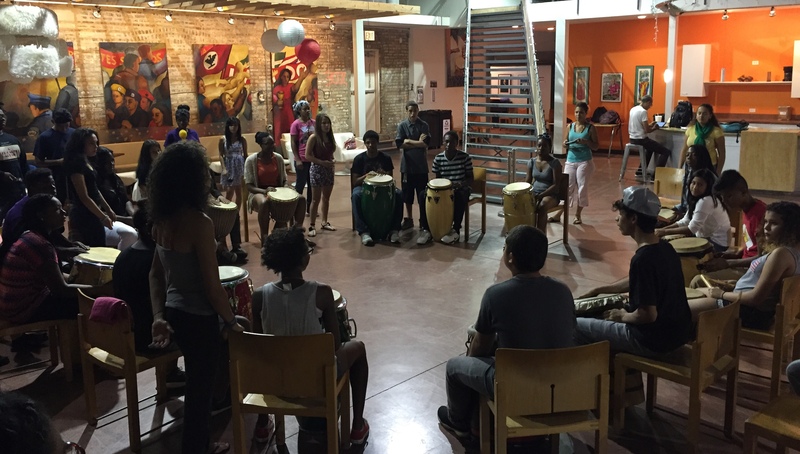 Our Chicago Kaleidoscopes program involves a collaboration with the Segundo Ruiz Belvis Cultural Center. CK has been meeting at SRBCC at the beginning of our Monday sessions since the second week of the program, and we will be at SRBCC for two more Mondays (2-4 p.m. on August 3rd and August 10th). Most of Chicago Kaleidoscopes happens at Mozart Park, and we’re grateful that SRBCC has given us the opportunity to have part of our program happen there! Performing and recording audio pieces that combine spoken word and percussion. In addition to the ASM sessions that we have been doing at SRBCC, we have worked on other activities that investigate connections between creative writing and music. For instance, we read and talked about “The Making of the Drum” by Kamau Brathwaite, “Jazz Fan Looks Back” by Jayne Cortez, and part of “Bop” by Langston Hughes. Check out these audio recordings of CK teens that include on connections between poetry and percussion. We’re getting ready for our field trip to Fermilab, which happens next Wednesday. Our field trip also includes a walk through the Fermilab Art Gallery; the On that Note visualization of music exhibition is currently on display in the gallery. One of the purposes of this field trip is to explore meaningful connections between the arts and science. Chicago Kaleidoscopes looks at key aspects of Chicago’s identity via creative writing, and one aspect of this city is the scientific research that happens in the Chicago area. Italian born physicist Enrico Fermi taught at the University of Chicago; in 1942 Fermi created the first controlled nuclear reaction at UC. Really looking forward to this field trip! We will meet in the cafe on the first floor of the Cultural Center. From there we will walk upstairs to spend some time in the House Music exhibition. Then we will walk into the G.A.R. Memorial Hall and explore the two adjoining rooms. 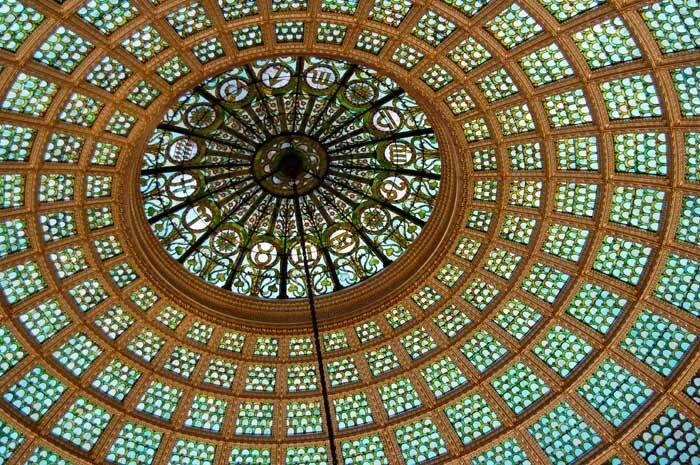 After that we will walk into Preston Bradley Hall and check out the Tiffany Dome. After that we will go to Archibald Motley: Jazz Age Modernist and Love for Sale: The Graphic Art of Valmor Products — two art exhibitions that are on the fourth floor. Then we will walk back downstairs. From there we will walk southward along Michigan Avenue, and then we will walk into the Harold Washington Library Center. We will go on a tour of YOUmedia, and our field trip will conclude with a F.L.O.W. Open Mic event hosted by YOUmedia. Chicago Kaleidoscopes teens will have the opportunity to perform during this event.